Für die Detektivromanreihe der Autorin Dia Lane habe ich die Cover und einige weitere Illustrationen gezeichnet. Kürzlich ist der zweite Band der spannende Detektivgeschichten um den Privatdetektiv Bailey Whittemore erschienen! Jeder Band enthält einen abgeschlossenen Fall und lässt sich auch einzeln lesen. Last year I painted this motif for the second edition of the German indie comic trading card game "Spiel mich!". There is a real game system to compete with the characters from different indie comics against each other. Earlier this year I painted this motif for the first edition of the German indie comic trading card game "Spiel mich!". It was a little bit hard until I had the sketch together. But the colours went very fast. The first edition of "Spiel mich!" was published this year for the Comic Salon Erlangen. There is a real game system to compete with the characters from different indie comics against each other. 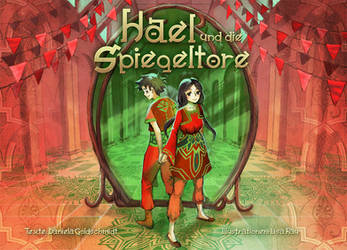 Il try to complete the uploads of the illustrations for my picture book "Hael und die Spiegeltore" here. This one was an extra at the end. Sometimes I wish I had done more rendering. But it was printed quite small so I didn't want to put too much effort in details. It's about the atmosphere! Das Bilderbuch "Hael und die Spiegeltore" gibt es im Freibeutershop! Got tagged by leinchen a long time ago. 1. Write 10 things about yourself. 2. The other rules about tagging hereby are declared invalid. Mah, let's see... What could be interesting? 1. Some day I want to draw a whole comic book that gets published. 2. I like India and Hindi Films. 3. I live in Germany but studied for half a year in London which was a great and memorable experience. 4. While my preferential passion is drawing/painting, I also love photography and filming. For that purpose I got myself a Canon EOS 550D. 5. I can type about 485 characters (88 correct words) per minute, using touch typing. 6. I've been wearing glasses since I was 14 or 15. 7. I generally don't watch horror films. 8. I grew up close to a farm. As a child it was great to visit the animals and to play (without permission) in the barn and on the fields. There was also a fishing lake and a forest with a little river nearby. 9. I like train journeys as long as I don't have to worry about connecting trains. 10. I always played Nintendo games. We never had a Playstation or other consoles at home (asside from regular computers). Amazingly drawn characters and backgrounds!